Cities are faced with many problems such as urban sprawl, congestion, and segregation. They are also constantly changing. 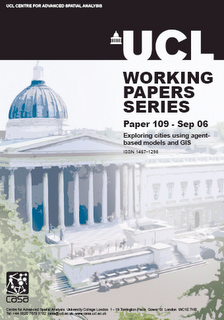 Computer modelling is becoming an increasingly important tool when examining how cities operate. 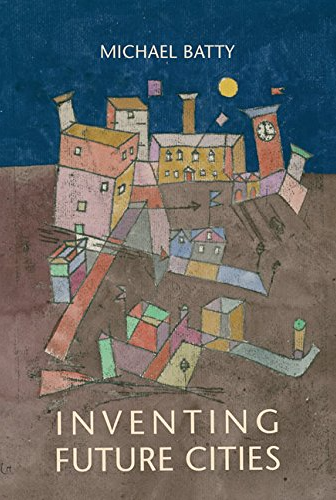 Agent based models (ABM) allow for the testing of different hypotheses and theories for urban change, thus leading to a greater understanding of how cities work. This paper presents how ABMs can be developed by their integration with Geographical Information System (GIS). To highlight this, a generic ABM is presented. 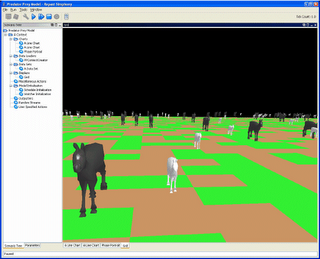 This is then applied to two model applications: a segregation model and a location model. Both models highlight how different theories can be incorporated into the generic model and demonstrate the importance of space in the modelling process. Keywords: Agent-Based Models, Repast, GIS, Segregation, Bid Rent. The paper is available for download at the CASA website under working papers. Alternatively click here. Whilst still being maintained RepastJ, Repast.Net and RepastPy have now reached maturity and are no longer being developed. They have been superseded by Repast Simphony (RepastS) which provides all the core functionality of RepastJ or Repast.Net, although limited to implementation in Java. The Repast development team have provided a series of articles regarding RepastS. The architecture and core functionality are introduced by North et al. (2005a), and the development environment is discussed by Howe et al. (2006). The storage, display and behaviour / interaction of agents, as well as features for data analysis (i.e. via the integration of the R statistics package) and presentation of models within Repast S are outlined by North et al. (2005b). Tatara et al. (2006) provide a detailed discussion outlining how-to develop a “simple wolf-sheep predation” model; illustrating RepastS modelling capabilities. Howe, T.R., Collier, N.T., North, M.J., Parker, M.T. and Vos, J.R. (2006), 'Containing Agents: Contexts, Projections, and Agents', Proceedings of Agent 2006 Conference on Social Agents: Results and Prospects, Chicago, USA. North, M.J., Howe, T.R., Collier, N.T. and Vos, J.R. (2005a), 'The Repast Simphony Development Environment', Proceedings of the Agent 2005 Conference on Generative Social Processes, Models, and Mechanisms, Chicago, USA. North, M.J., Howe, T.R., Collier, N.T. and Vos, J.R. (2005b), 'The Repast Simphony Runtime System', Proceedings of the Agent 2005 Conference on Generative Social Processes, Models, and Mechanisms, Chicago, USA. Tatara, E., North, M.J., Howe, T.R., Collier, N.T. and Vos, J.R. (2006), 'An Introduction to Repast Simphony Modeling using a simple Predator-Prey Example', Proceedings of the Agent 2006 Conference on Social Agents: Results and Prospects, Chicago, USA. Repast Simphony can be downloaded from the Repast website. 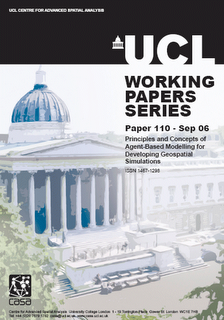 The aim of this paper is to outline fundamental concepts and principles of the Agent-Based Modelling (ABM) paradigm, with particular reference to the development of geospatial simulations. The paper begins with a brief definition of modelling, followed by a classification of model types, and a comment regarding a shift (in certain circumstances) towards modelling systems at the individual-level. In particular, automata approaches (e.g. Cellular Automata, CA, and ABM) have been particularly popular, with ABM moving to the fore. 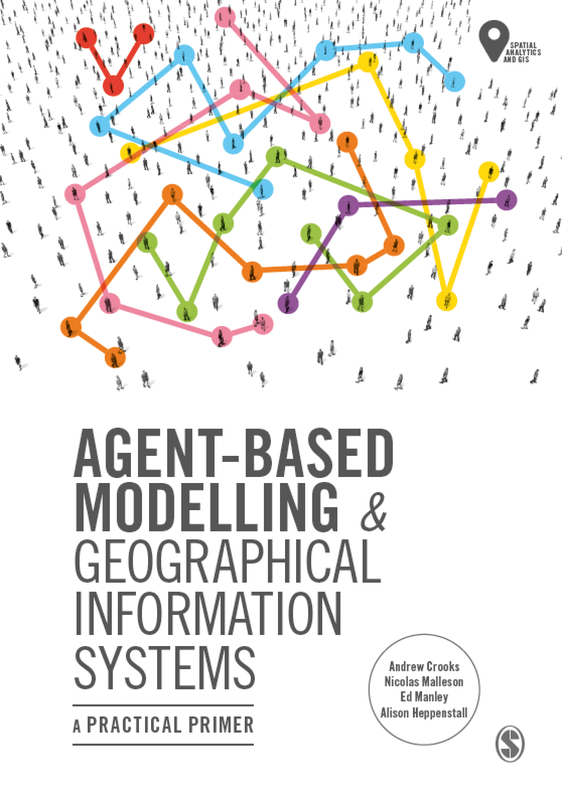 A definition of agents and agent-based models is given; identifying their advantages and disadvantages, especially in relation to geospatial modelling. 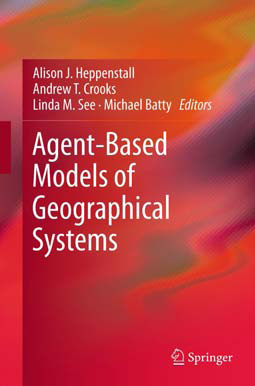 The potential use of agent-based models is discussed, and how-to instructions for developing an agent-based model are provided. Types of simulation / modelling systems available for ABM are defined, supplemented with criteria to consider before choosing a particular system for a modelling endeavour. Information pertaining to a selection of simulation / modelling systems (Swarm, MASON, Repast, StarLogo, NetLogo, OBEUS, AgentSheets and AnyLogic) is provided, categorised by their licensing policy (open source, shareware / freeware and proprietary systems). The evaluation (i.e. verification, calibration, validation and analysis) of agent-based models and their output is examined, and noteworthy applications are discussed. Geographical Information Systems (GIS) are a particularly useful medium for representing model input and output of a geospatial nature. However, GIS are not well suited to dynamic modelling (e.g. ABM). In particular, problems of representing time and change within GIS are highlighted. Consequently, this paper explores the opportunity of linking (through coupling or integration / embedding) a GIS with a simulation / modelling system purposely built, and therefore better suited to supporting the requirements of ABM. This paper concludes with a synthesis of the discussion that has proceeded. Key Words: Agent-Based Modelling (ABM), agent-based models, geospatial / spatially explicit modelling, verification, calibration, validation, Geographical Information Systems (GIS), linkage (coupling or embedding / integration). RedfishGroup is an organization of complexity researchers, software developers and business professionals applying Complex Adaptive Systems to business and government agencies. What is really amazing about the group is their approach to modelling, combing ABM to other techniques such as GIS and producing highly visual and informative models. Santa Fe on Fire: Agent-based modelling of wildfire evacuation dynamics was presented by Stephen Guerin at Agent 2006. The project for the City of Santa Fire Department integrating wildfire simulation and ABM of traffic dynamics. ArcGIS was used for preparing the data sources, NetLogo was used for prototyping the wildfire models and the network-based traffic models along with using FARSITE and Blender3D for further model development. Results from the model where outputted to Google Earth and QuickTime. The Pittsburgh project explored Crowd Dynamics with an Agent-Based Model, and used to study evacuation from the Baseball Stadium. For example modelling the emergency scenario involving a bomb exploding in seats and subsequent disaster scenes that the explosion triggered inside and outside the ballpark. The projects listed also have the added advantage of sharing their source code, which I personally believe is really great, as it allows others to learn. The ability to carry out ABM in a highly visual and interactive manor allows the modellers to communicate ideas and theory to the public. For example in the case of Santa Fe on Fire, the visualisations evacuation dynamics were used to communicate with citizens dangers faced during evacuations and to explore when shelter-in-place is a reasonable alternative to evacuation.